Some literature provided by the city notes that Matsumoto Jo was constructed with the idea of both fighting with and defending itself from teppo, Japanese firearms. The inner moat, for example, was designed to be 60 meters wide to put it out of reach of most arms fire. The brochure also notes that the castle made use of long barrel "Hazama guns" which had a range of more than 300 meters. The second floor of the Main Tower of castle boasts a formidable collection of teppo, donated to the city by Matsumoto native Akahane Michishige and his wife in 1991. 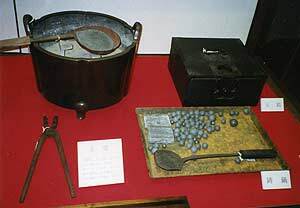 The exhibit features many kinds of firing weapons, including a 250-gram loader that may have been importantly involved in the Battle for Osaka Castle in 1607. Illustrations show different means of transporting and firing various weapons. 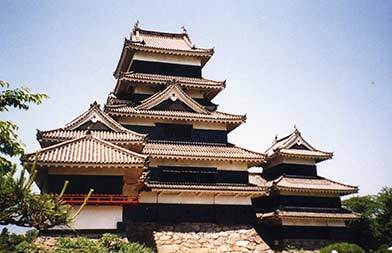 Given Matsumoto Jo's facility in using and defending against teppo, the castle is a fitting exhibition space. (Right) Teppo on display on the second floor of the Main Tower. 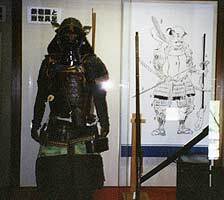 (Left) A suit of armor, along with an illustration of a teppo-toting marksman. 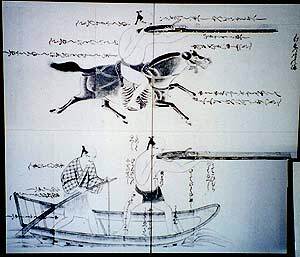 An illustration shows the method for firing teppo from horseback and from a boat. A means of melting lead and molding bullets. The third floor is the hidden floor, also called the "dark floor", as it has no windows and is not visible to the outside. It was also used for storage, but may have had some kind of strategic value as well. Every castle had hidden floors (and sometimes hidden passages - Shirasagi Jo has both). In the heat of battle the hidden floor may have provided advantage to the defenders. While the enemy would have been aware of the existence of a hidden floor, its location may not have been obvious until the invaders were trapped inside, in the dark. The fourth floor presents a real contrast to the one below. The beams have been finished and the pillars that run throughout the building are less evident here. More windows give more light and the floor, though it is smaller than the ones below, seems larger and more spacious. It is possible this was the lord's chamber, where he conducted the business of the castle and the surrounding area. He would not have slept here; a comfortable house on the castle grounds (now gone) would have served as an official residence. The commentary on this floor speculates that folding screens and curtains may have marked off certain areas, rather than actual walls. The result was probably better circulation of air and light, especially in hot weather, as well as maintaining a sense of grandeur appropriate to a castle lord's position. (Left) Summer-woven curtains provide privacy and allow air circulation on the fourth floor (the loudspeaker is not part of the original door). 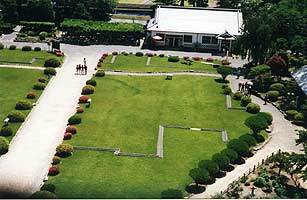 (Right) foundation of the daimyo's residence is outlined in stone in the garden below. The fifth floor has good visibility on all sides. This was the strategic office, and I could see the outer perimeters very well in every direction. Down below, inside the castle complex is a garden where outlines of buildings that collapsed long ago, including the daimyo's residence, are picked out in stone, accented by brilliant azaleas. The formidably steep climb eventually brought me to the very top, to a very small room indeed, from which we could see the city in all directions, and the mountains beyond. From the top floor, we were directed down to the Southern Wing, to yet another unique feature of Matsumoto Jo. Lord Naomasa Matsudaira, a grandson of Tokugawa, Ieyasu (Japanese military leader and statesman, founder of the Tokugawa dynasty of Shoguns who ended the chaotic period of feuding clans by unifying Japan under a single military rule), convinced, eventually, that peace was here to stay, had a vermillion-trimmed Moon-Viewing Tower constructed in the 1630's. It is the only bit of color to be seen in the castle complex. The room was very pleasantly situated, with windows on three sides to let in the view and any passing breeze. I could imagine there had been many pleasant evenings here. Matsumoto Jo remained in the hands of Tokugawa daimyo until the change of government in 1868. 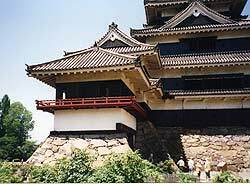 At that point, the Toda family, who had been the area's last shogunal administrators, left the castle and the buildings became the property of the Imperial government. Matsumoto Jo was to be auctioned off, in pieces if necessary, apparently the fate of many Tokugawa official buildings. The proud citizens of Matsumoto, however, took matters into their own hands. A plaque in the garden below notes that a gentleman named Ichikawa Ryozo led the movement to raise money and buy the buildings and grounds intact. In some ways Matsumoto Jo and the Tokugawa administration had made Matsumoto the proud city it had become, and apparently the citizenry decided to repay the favor. 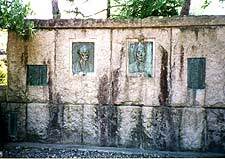 (Left) A plaque in the garden honors the two "Men of Merit" who saved Matsumoto Jo: Ichikawa (left) and Kobayashi (right). (Right)Pride of the City - A view of Matsumoto Jo from the inner garden. By the early 20th century, however, the castle had fallen into disrepair, and the elements were in danger of accomplishing what the Meiji government did not do. This time it was Kobayashi Unari, a headmaster of the Matsumoto Middle School, who led the movement to raise money for restoration and creation of the surrounding park, in 1902. Now, as a National Treasure of Japan, Matsumoto Jo stands proud in the center of town, where its citizens come to cool themselves by the inner moat, and admire it for many hot spring and summer days to come. Note: A major source of information on Matsumoto Jo is contained in the many placards placed around the castle and grounds, in both Japanese and English. n. d. "Matsumoto Jo - National Treasure and its features" - fact sheet from the Matsumoto Castle Administration Office. n. d. "Teppo-gura: Gun Exhibition Matsumoto Castle" (brochure), Matsumoto Castle Administration Office. n. d. Friday, Karl - personal communication with the author.